Is it possible to be indifferent to a four-course dinner? The very first piece of advice the Book of Healthy and Tasty Food gives about cooking is not about cooking at all. This week I followed the Book’s first piece of advice – printed on the side of page 53, which is my excuse for not noticing it sooner. My husband and I consumed the dinner with appetite and appreciated its color and smell, if not necessarily the appearance, and the courses were a bit of a funny combo. 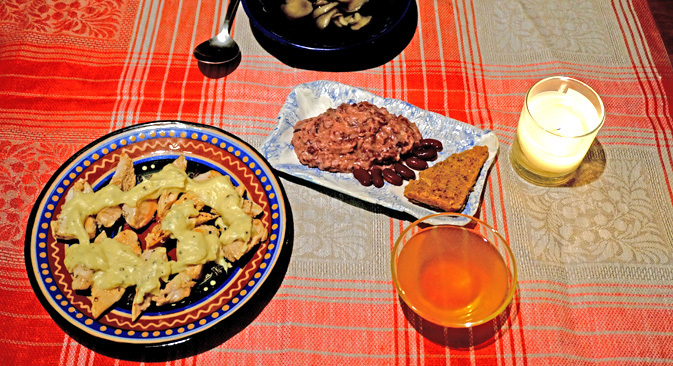 A lot of the Soviet cooking I’ve done so far has been much like an eccentric aunt paying a visit – fun, entertaining, gives you something to talk about, but one night is enough. I did get quite interested in the first piece of advice though – that being indifferent to food is not something to brag about. My stepfather has actually bragged about never eating anything that takes more than 10 minutes to prepare. I wonder how he went through his childhood in the Soviet Union– I don’t think they had instant soups then! I was curious what my grandmother would have to say about that: Was indifference toward food a “trend” in the Soviet times? What food trends were there, if any? I find it really impressive that in a situation of incredible food shortages, people would still find a way to have food crazes, although it seems a lot of them didn’t go anywhere after the peak of their popularity. As for my dinner menu, Granny simply said “woooow” and didn’t comment further, but I knew what she meant. That’s where we parted with respected “wows” – mine being about her stories and the special lunch she served me in honor of maslenitsa, the week when everyone eat pancakes - and I also got to take some pancakes home. I certainly won’t show any indifference towards those! Washed mushrooms in warm water and let them dry. Then, peel the onion and cut it in half. Put the dry mushrooms and the onion in a pan, cover with cold water and cook at a low boil for 2-2 1/2 hours. To speed up the process, soak the mushrooms for 1-2 hours in cold water before bringing to a boil. Drain the mushrooms, reserving the broth. Chop the mushrooms and return to the broth. Boil the beans until soft. Mix with prepared onions. Add oil, salt, vinegar and pepper to taste. Put on a plate and refrigerate. Put a raw chicken in a pan. Add peeled, washed and sliced ​​roots and onion, pour broth or water 3/4 the height of the chicken. Salt the chicken. Cover the pan with a lid and boil for 1-1/2 hours. After the chicken is cooked, prepare the sauce. Combine 1 ½ Tbsp flour with the same amount of oil. Combine with 1 ½ cups of chicken broth. Stir and boil until smooth – 5-10 minutes. Strain the sauce and add a teaspoon of lemon juice, salt to taste and a tablespoon of butter. You can make an even tastier sauce by adding ½ cup of white wine. Serve chicken cut into pieces on a warmed platter and pour sauce over it. For a garnish, you can use green beans seasoned with butter, boiled rice or boiled potatoes. In the sauce, you can add sliced mushrooms. Pour 3 cups of water into a saucepan. Add sugar, stir and boil. When the sugar has dissolved, add the zest of half the lemon and the gelatin. While stirring constantly, bring the syrup to a boil and add the juice of the lemon. Strain the hot syrup through a cheesecloth and pour into molds or bowls. Let cool.